Striker Tammy Abraham has stated his desire to have an international career with England following reports of interest from Nigeria. London-born Abraham, on loan at Swansea from Chelsea, has played for England Under-21s but has a Nigerian father. And the Nigerian Football Federation (NFF) were thought to be keen to recruit the 19-year-old. However, Abraham said: "I have informed The FA that I remain available for selection for England." He continued: "Contrary to reports in the media I would like to clarify that I have not agreed to switch my national team allegiance. 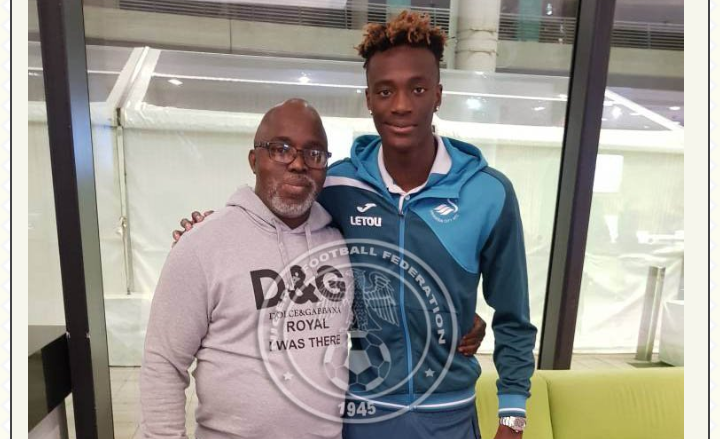 "I can confirm I met the President of the NFF after our last game against Tottenham at Wembley on Saturday given he is a friend of my father. "However, any suggestion that I have made a decision to change my international representation is incorrect and wide of the mark." His words will be welcomed by Swansea boss Paul Clement, who believes he would be better off remaining with England. "Hopefully he stays with the English national team," Clement said. "I'm not sure if he'd be better off career-wise - I'm saying it because I'm English and he's a good English talent, so you want him involved in the national team. "From my point of view, there will be no influence from me. "If he wants to ask for advice, of course I'll be there to do it, but I'm sure, between him and his family, he'll make the right decision." NFF President Amaju Pinnick says that after a meeting with Abraham and his agent "all is looking good" for him to play for Nigeria. Chelsea wing-back Victor Moses, Arsenal midfielder Alex Iwobi and Reading striker Sone Aluko are among those to have represented England at youth level before switching to play senior international football for Nigeria.